Can Dogs eat Mayonnaise? Or are there any health risks? Love it or hate it; mayonnaise is a popular addition to sandwiches, dips and other dishes. Its manufactured by a number of different companies and comes in both full fat and light versions. But can dogs eat mayonnaise too? Technically yes, but due to the high amount of fat they really shouldn’t! Mayonnaise is indulgent, rich and full of flavor; and that flavor comes from fat! It’s what makes food so delicious, yet fat can be bad for our dog’s in much the same way in which it can be bad for people. A cup of mayonnaise can contain a staggering 1440 calories, 160 grams of fat and 24 grams of saturated fat. Now in people, saturated fat can cause an increase in cholesterol levels which can encourage heart problems. Dogs do not appear to suffer in as extreme a fashion, but the additional fat will encourage weight gain which causes its own problems. An overweight dog will have increased strain placed on their joints and important organs such as the heart. They will also be more prone to weight related diseases such as diabetes. An obese dog will ultimately have a shorter lifespan. Too much mayonnaise in your dog’s diet will cause a nutritional imbalance. They should receive all the nutrients they need from a complete balanced diet with the addition of suitable supplements and dog friendly treats as needed. No, the main plus point with mayonnaise is that it is non-toxic. Consuming a large quantity all at once may result in a stomach upset due to its richness, but it is not going to be life threatening. The oil and the protein in mayonnaise can aid coat and skin quality, but the high fat content negates this benefit. If you really want to improve your dog’s coat and skin, try one of the purpose made supplements such as salmon oil instead. 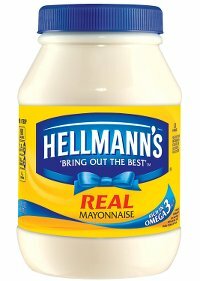 What about other types of mayonnaise? In addition to normal and light mayonnaise, there are many other varieties such as chipotle, tuna, egg and even truffle mayonnaise. Spicy mayonnaise can upset your dog’s stomach yet sometimes the ingredients in the mayonnaise are safe to feed to dogs in small amounts, such as tuna or eggs. However although again these are non-toxic, they are still contained in the mayonnaise itself and as such still contain large quantities of fat. They are therefore still unhealthy, so are best avoided. Eggs by themselves can benefit your dog. If you would like to add eggs to your dog’s diet, check out this article here. Tuna can also be fed in moderation but there are a few things to be aware of. Again for the full facts, have a read of this. The odd bit of mayonnaise will not harm your dog, but again this is a food with little plus points. Don’t panic if your dog eats it, it isn’t toxic. Just try and find an alternative if you can.